Gov. Terry McAuliffe has launched a workforce initiative aimed at boosting the number of workers obtaining industry credentials while improving employment opportunities for veterans. 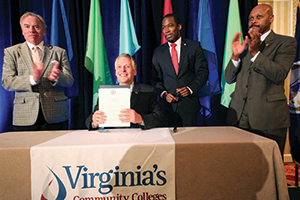 McAuliffe signed an executive order in mid-August establishing “The New Virginia Economic Workforce Initiative” to be led by Secretary of Commerce and Trade Maurice Jones. The plan includes a “Pathway to 50” goal for Virginians attaining 50,000 credentials, licensures, apprenticeships and associate degrees by the end of governor’s term in 2018. The plan also features “The Patriot Pledge,” which will ask 10,000 Virginia businesses to pledge to hire more veterans. McAuliffe said the initiative’s goals include aligning Virginia’s workforce with skills needed by today’s businesses. In addition to attracting new businesses, the initiative seeks to ensure Virginia’s workforce is prepared to replace an estimated 930,000 retiring workers. Many of these jobs are in scientific, technical or health-care fields that require postsecondary training, McAuliffe said. The executive order outlines a series of steps to increase worker credentialing and align workforce skills with business needs. For example, it directs state agencies to design goals and strategies to increase credential attainment rates. By Dec. 1, Jones will present a plan to create “A Diversified Dominion,” with a goal of diversifying Virginia’s economy.